Carrie Ann Plank is an San Francisco based artist working in the mediums of installation, printmaking, painting, and glass. Plank's work is included in many private and public collections including the Fine Art Archives of the Library of Congress, Fine Art Museums of San Francisco, Achenbach Foundation for Graphic Arts, the Guanlan Print Art Museum in China, and the Iraq National Library in Baghdad. Recent and upcoming noteworthy shows include solo shows at DZINE Gallery in San Francisco, The Academy of Art University, Bullseye Projects in Portland, OR, and Fourth Wall Gallery, Oakland, CA. Recent residencies include Edition/Basel: Printed in Cuba at the Taller Experimental de Gráfica de La Habana in Havana, Cuba, the Íslensk Grafík in Reykjavik, Iceland, Edition/Basel: Printed in Basel at Druckwerk in Basel, Switzerland, Mullowney Printing in San Francisco, CA, Haystack Mountain School of Craft in Deer Isle, ME, and Bullseye Glass in Emeryville, CA. Additionally, Plank has had a 20 year teaching career and most recently served as the Director of the Printmaking MFA & BFA Programs at the Academy of Art University before devoting herself solely to her artist practice in 2018. 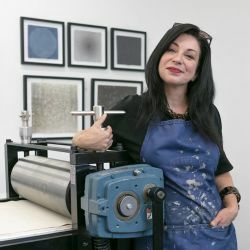 She is active in the local arts community as a participant, juror, and volunteer, and is a board member of the California Society of Printmakers. She received her Bachelor of Fine Arts in Printmaking from East Carolina University and her Masters of Fine Arts in Printmaking from the Pennsylvania State University.